On August 10, 2002, about 1620 eastern daylight time, a Cessna 182R, N9307X, registered to the Civil Air Patrol (CAP), operating as a 14 CFR Part 91 training flight, crashed on Cross Mountain, located about 2 ½ miles north west of Lake City, Tennessee. The Commander of the local Civil Air Patrol unit [Dyersburg Squadron] of Tennessee Wing was killed Saturday afternoon, August 10, 2002, during a training exercise in the mountainous Anderson County terrain. Maj Fred Vatcher, 64, of Meacham Road, was attempting to gain re-certification for CAP mountain-flying techniques when the plane in which he was riding crashed into Cross Mountain. Rescuers believe he and the other two men aboard – CAP instructor Gerald McLinn, 47, of Knoxville, and Chuck Hall, 39, of Maryville – were killed instantly. Visual meteorological conditions prevailed and an internal CAP flight plan and a computer weather briefing were obtained. The airplane was destroyed. The airline transport pilot-in-command, airline transport rated certified flight instructor (CFI), and commercial rated pilot passenger were fatally injured. The flight originated from Jacksboro Campbell County Airport, Jacksboro, Tennessee, at an undetermined time. Civil Air Patrol ground search team located the wreckage on August 11, 2002. 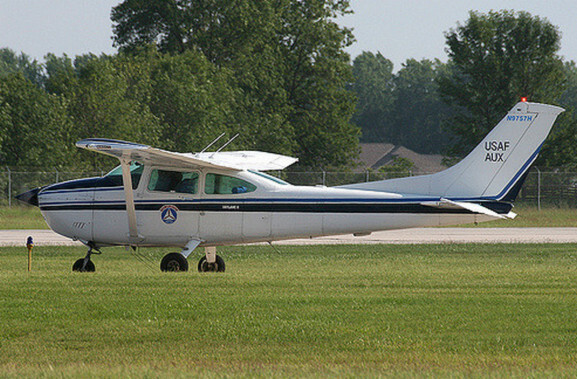 The Tennessee Group Commander for the Group 1 Civil Air Patrol located at Knoxville Downtown Island Airport, Knoxville, Tennessee stated the three pilots attended a mountain flying clinic on the morning of the accident. The pilots were then scheduled to conduct mountain training with a CAP instructor pilot/check pilot. The three pilots departed Knoxville between 1315 to 1330. The Group Commander overheard the CFI tell the other pilots receiving instruction that the commercial pilot passenger would be the first pilot to fly and they would land and switch seats at another airport. The pilots were expected to return at about 1600 according to the CAP Form 104 Mission Flight Plan/Briefing Form completed for the training flight. The crew indicated on CAP Form 104 that they would be flying in Search Area A conducting mountain flying, which includes Lake City, Tennessee and Cross Mountain. A witness stated he and a friend were on Cross Mountain scouting for deer when an airplane flew over their location at a very low altitude. The airplane flew into the valley and made about six steep left turns at about 45-degrees angle of bank. The airplane was so low that the witness could see the people in the airplane waving at them. The airplane flew back over their location at about 1620, flew back into the valley, and was observed to make another steep turn to the left before the airplane disappeared from view. They heard the engine go wide open and then heard a sound a few seconds later like trees popping. Review of information on file with the FAA Airman’s Certification Division, Oklahoma City, OK, revealed the pilot-in-command was issued an airline transport pilot certificate on August 17, 2001, with ratings for airplane multi-engine land, instrument airplane, and commercial pilot certificate, airplane single engine land. The pilot was type rated in several aircraft. The pilot held a first class medical certificate issued on May 17, 2002, with the medical restriction “must wear corrective lenses.” The pilot was issued a Statement of Demonstrated Ability on November 18, 1987 with the limitation “must wear corrective lenses.” The pilot reported on his application for the FAA first class medical certificate that he had accumulated 12,500 hours. The pilot’s flight logbook was not located. The pilot joined the CAP on November 28, 1978, and his current duty position in Group 1 is mission pilot. Review of CAP Form 5 revealed he completed a recurrency and instrument check ride on June 16, 2001, and he completed a CAP Form 91 mission check ride on September 1, 2001. He completed initial mountain classroom training on the day of the accident. Review of information on file with the FAA Airman’s Certification Division, Oklahoma City, OK, revealed the commercial pilot rated passenger was issued a commercial pilot certificate July 28, 1978, with ratings for airplane multi-engine and single engine land, and instrument airplane. The pilot held a second-class medical certificate issued on December 19, 2001, with the medical restriction “must wear corrective lenses for near and distant vision.” The pilot reported on his application for the FAA second-class medical certificate that he had accumulated 1,300 hours. The pilot joined the CAP on June 4, 1991, and served as the Squadron Commander and mission pilot for Group 1. Review of CAP Form 5 revealed he completed his biennial flight review on June 11, 2001. He completed a CAP Form 91 mission check ride on June 16, 2001. He completed recurrency mountain classroom training on the date of the accident. Review of aircraft maintenance records revealed N9307X last recorded annual inspection was conducted on May 15, 2002, and the airplane had accumulated 72 hours since the annual inspection. The engine was overhauled on January 1, 2001, and the engine had accumulated 568.5 hours since top overhaul. The total time since major overhaul is 1,903.1 hours. The propeller was overhauled on March 10, 2000, due to the propeller picking up a tie down rope during a taxi incident. The air-frame had accumulated 3,135.3 total hours at the time of the accident. The nearest weather reporting facility at the time of the accident was McGhee Tyson Airport Knoxville, TN. The 1553 surface weather observation was: 700 scattered, visibility 10 miles, temperature 87-degrees Fahrenheit, dew point temperature 64-degrees Fahrenheit, wind 260-degrees at 9 knots, and altimeter 30.12. The wreckage of N9307X was located on the side of Cross Mountain (Elevation 3,534 feet) in a heavily wooded area about 2.5 nautical miles north west of Lake City, Tennessee. Cross Mountain makes up one side of a valley/canyon. Examination of the crash site revealed the airplane collided with a tree 90 feet tall at an elevation of 2,649 feet on a heading of 112 degrees magnetic. The crash debris line on a heading of 090-degrees magnetic. The left elevator was separated at the outboard hinge and was 147 feet from the initial point of impact and was located left of the crash debris line. A section of the left elevator, not including the counterweight, and a outboard segment of the left horizontal stabilizer were located to the right of the crash debris line 159 feet from the initial point of impact. A tree impact was noted inboard of the horizontal stabilizer tip. Wreckage debris was scattered down a 45-degree down slope. A propeller strike was noted on a tree trunk 212 feet from the initial point of impact with the imprint of the propeller blade tip. Numerous pieces of the fuselage and wing skin were located along the crash debris line. The right wing tip was separated from the right wing and was located 246 feet from initial point of impact left of the crash debris line. The right outboard wing including two ribs and four feet of the right wing trailing edge, and right aileron outboard hinges separated inboard of the wing tip and were located to the right of the crash debris line 253 feet from the initial point of impact. A tree impact was located on the leading edge of the right wing inboard from the wing tip. The left wing collided with a tree 40 feet above the base of the tree and separated 295 feet from the initial point of impact. The airplane rested in a nose down 85-degree attitude lodged against a tree 344 feet from the initial point of impact. The engine assembly separated from the firewall. Both propeller blades separated from the fragmented propeller hub. Both propeller blades exhibited evidence of torsional twisting and “s” bending. The nose gear was separated from the air-frame and the left and right main landing gear remained attached to the air-frame. The cabin area was compressed aft forward of the main landing gear. The cabin roof was separated from the right doorposts. The cargo compartment was compressed forward towards the main landing gear box. The right wing was separated from the wing root, and remained attached to the forward doorpost, and upper right door sill. Accordion crushing was present on the leading edge. The right main fuel tank was ruptured and about three gallons of fuel were present. Browning of vegetation was present in the vicinity of the main wreckage. The right flap and flap actuator were in the retracted position. The right wing strut was attached to the lower spar and fuselage fitting. The empennage sustained compression wrinkling from the baggage compartment aft to the tail cone fairing. The right horizontal stabilizer sustained multiple tree impact damage outboard of the fuselage. The right elevator remained attached to the horizontal stabilizer inboard of the trim tab actuator. The trim tab and elevator counter weight remained attached to the separated elevator. The rudder assembly separated below the upper rudder rib assembly. The lower section of the rudder assembly remained attached to the two lower rudder hinges. The vertical fin and dorsal assembly were crushed to the right. The horizontal stabilizer was bent aft 60-degrees and separated from the aft bulkhead. The left wing separated at the wing root and was pushed aft. Multiple tree strikes were present on the leading edge of the wing outboard of the wing root. The wing tip was compressed inboard at a 30-degree angle, outboard of the wing root. The left wing was bent upward inboard of the wing tip. The left main fuel tank was ruptured and browning of vegetation was present. The left direct aileron flight control cable was ripped through the upper leading edge of the left wing and remained attached by 1 cable strand of wire. The flaps were in the retracted position. The left main wing strut was attached to the lower spar. The upper attachment fitting was fractured aft. The lower left wing strut was separated from the fuselage with fuselage structure attached. Examination of the engine assembly revealed the oil pan was crushed. The oil pan was removed and access was gained to the engine’s components. The crankshaft, camshaft, connecting rods, counterweights, and gears were all intact. The No.5 cylinder sustained impact damage. Continuity was observed through the gear train. All internal parts were oil coated. All camshaft lobes were smooth without scoring or pitting. No metal was present in the oil pan or oil pick up tube screen. The No. 5 cylinder was removed. Engine continuity was established through the gear train and thumb compression and suction was established on all cylinders except for cylinder No. 5 which sustained impact damage. The carburetor was separated from the engine and no fuel was present. The carburetor float bowl was disassembled, the float bowl was clean, and the float was operative. Both magnetos were removed and produced spark on all leads when rotated by hand. Examination of the air-frame, and flight controls revealed no evidence of a pre-crash mechanical failure or malfunction. All components necessary for flight were present at the crash site. Continuity of the flight control system was confirmed for pitch, roll, and yaw. The Forensic Pathologist, University of Tennessee Medical Center, Medical Examiners Office, Knoxville, Tennessee, conducted a postmortem examination of the pilot-in-command, on August 12, 2002. The cause of death was multiple blunt force trauma. Postmortem toxicology of specimens from the pilot was performed by the Forensic Toxicology Research Section, Federal Aviation Administration, Oklahoma City, OK. The results were negative for carbon monoxide, cyanide, and ethanol. Diphenhydramine 0.025 (ug/ml, ug/g) an antihistamine used to relieve seasonal allergy symptoms was detected in the blood and liver. The Forensic Pathologist, University of Tennessee Medical Center, Medical Examiners Office, Knoxville, TN, conducted a postmortem examination of the airline transport pilot rated Certified flight instructor, on August 12, 2002. The cause of death was multiple blunt force trauma. The Forensic Toxicology Research Section, Federal Aviation Administration, Oklahoma City, Oklahoma performed postmortem toxicology of specimens from the pilot. Carbon monoxide and cyanide testing was not performed. No ethanol or drugs were detected. The Anderson County Medical Examiner, Lake City, TN, issued a Certificate of Death on August 10, 2002, from the Tennessee Department of Health for the commercial pilot located in the left rear passenger seat. No autopsy was performed. The cause of death was multiple injuries extreme secondary to an aircraft accident. Review of the Cessna Information Manual for the Skylane Model 182R revealed the stall speeds with no flaps at 30-degree angle of bank is 54 knots indicated airspeed ( KIAS), at 45-degree angle of bank is 60 KIAS, and 60-degree angle of bank is 71 KIAS. The manual states on page 10-8, Block 3 Mountain Flying, Canyon Flying, “If the canyon is not steep and if it is wide enough to allow a turnaround, it is acceptable to fly up the canyon, but only when it is certain that a turnaround maneuver can be successfully accomplished. Rules of Thumb for Canyon Flying…. • Always remain in a position to be able to turn toward lowering terrain. The wreckage of N9307X was released to the National Headquarters Civil Air Patrol, Chief of Safety, on August 14, 2002. The pilot’s failure to follow procedures pertaining to mountain flying, and the pilot’s failure to maintain airspeed that resulted in an inadvertent stall and subsequent in-flight collision with trees and terrain. A factor was the certified flight instructor inadequate supervision of the training flight. Be the first to comment on "CAP Pilot Error Results in 3 Dead in Tennessee Wing"